Issue: Hotspots do not work on dual monitors. Cause: Multiple monitors can have many different resolutions and recording two monitors will double the amount of data/memory used by Hotspot, currently looking into the most efficient method of doing this. Issue: Desktop APM copies data from one day to the next if the computer is asleep before midnight and woken after midnight. Workaround: Shut down your computer at the end of the day or disable sleep mode. Consider enabling a screensaver to reduce power consumption. Fix: This has been resolved in version 1.17 and above. 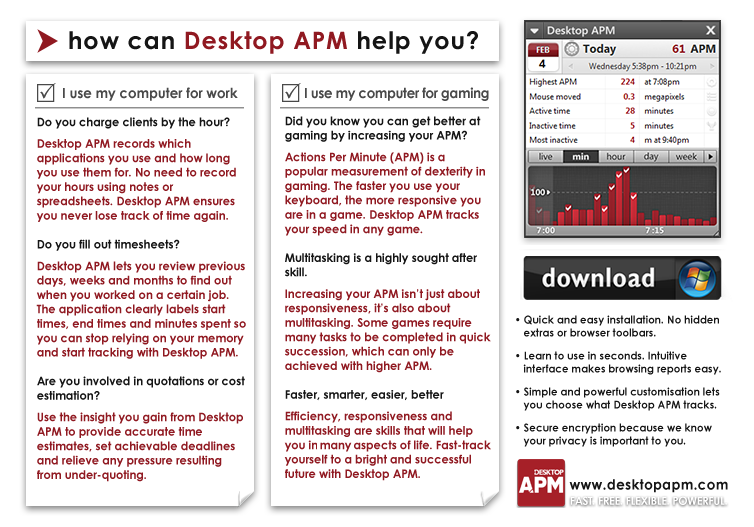 If you are using version 1.16 or below, please upgrade to the lastest version of Desktop APM. Cause: Desktop APM has minor issues graphing day/week data during the final week of December due to the clocking over of a new year. January data will be reported as normal and Timeline / Calendar are unaffected and can be browsed as normal. Issue: Timeline graph does not show when clicking on an item in the current day's timeline when using a rule that ignores all applications (*). Previous days are unaffected. Workaround: Browse to the previous day and back to today, or if you are unable to do this, restart Desktop APM. Fix: This will be fixed in the next version. Issue: Calendar sometimes no longer bolds dates for some months that contain APM information. Cause: Data corruption due to Desktop APM closing or losing power during a save. Issue: Graphs for Week view, Month view and Year view sometimes do not display, showing no previous information. Issue: Desktop APM does not work for users with unicode characters in their windows username. Cause: Desktop APM is not compatible with unicode. Issue: Timeline does not store applications with unicode in their titles and instead shows white squares. This makes it difficult to work with foreign languages applications and websites. Cause: Desktop APM is not compatible with unicode, a large scale upgrade to convert the software to unicode compatible will be required.